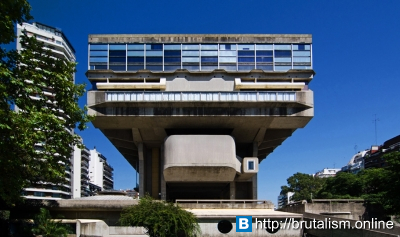 The National Library of the Argentine Republic (Biblioteca Nacional de la República Argentina) is the largest library in Argentina. It is located in the barrio of Recoleta in Buenos Aires. This is the “new” national library - the “old” one is located on Calle Mexico in San Telmo, a neoclassical building which now houses the National Centre of Music. The current library sits on the site of the former Unzue Palace, home to Juan and Eva Peron, and the place of Evita’s death. The palace was razed by a politically motivated demolition in 1958, after which the site was designated for the construction of a new library building. 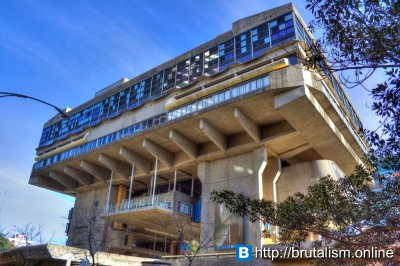 A national competition was held for the design of the new library, and was won by the architectural team of Clorindo Testa, an Italian-Argentine architect who pioneered Brutalism in Argentina, Francisco Bullrich and Alicia Cazzaniga, in 1961. 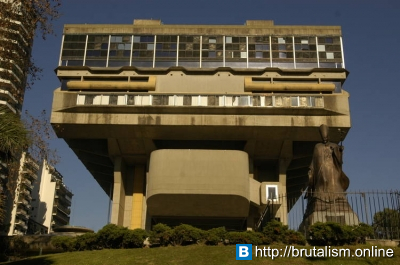 However, various political and social upheavals delayed the construction of the building until 1971, and it was only inaugurated in 1992. Future need for expansion of storage facilities. Exploitation of the urban context. Consideration and preservation of the existing landscaping and vegetation. The specifics of the brief are evident in the realization of the final construction. A raised plinth houses storage facilities underground and provides possibilities for expansion without disrupting the accommodation above ground. The construction at ground floor is minimal, exaggerating the public space at entry level, where the top of the raised plinth creates an elevated concourse from which views towards the river are framed and the undercarriage of the main bulk of the library building is visible. The public areas (reading rooms etc.) are lifted off the ground and form the most identifiable part of the library – a huge concrete plane with wrap-around glazing, perched on 4 cores that delineate the space below. 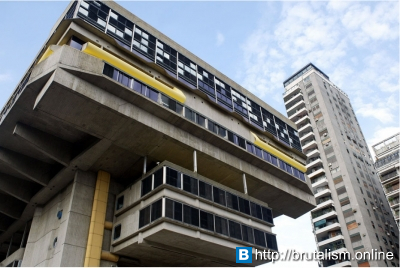 The building formally observes many Brutalist principles, the main one being the outward expression of the building’s constituent parts – the auditorium jutts out from underneath the main bulk; the four circulation cores lift the building into the air; the service risers are highlighted in yellow; the volumes of the stairwell and office spaces are extruded. But what is not immediately apparent is that the overall form of the building was based on that of a prehistoric mammal, the glyptodon. Structurally, the carcass of the building is referred to in biological terms – the circulation and service cores on which the concrete box sits are called the “hands” and feet”, the lower lying elements of the administration areas and auditorium are called the “belly” and “head” (which face Av. 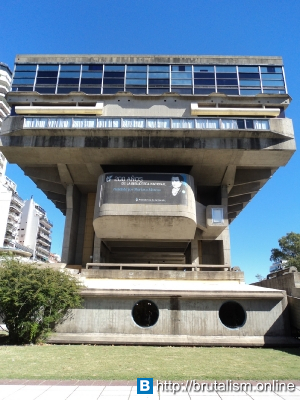 Libertador) and the beam that runs along the top of the concrete box is called the “spine”. The functional areas of the building are spread over the various floors. The archive and storage occupy the basement level. The entrance is on the ground floor, while the auditorium, café and exhibition space are located on the 1st floors are designated for reading rooms. Administration takes up the second and most of the third floor, while the 5th and floors are designated for reading rooms. Aside from the generous swathe of space found on the external entrance concourse, the reading rooms are the highlight of the library. Spacious and studious, the double height windows flood the perimeter with light and provide views towards the river and back onto Recoleta. Although they are quiet, the sound of the city continues to seep in, never letting you forget that you are in Buenos Aires.